More than two million tonnes of waste has been found in illegal or unapproved landfills. DAERA confirmed the location of 66 illegal dumps between 2006 and 2015, containing more than 724,000 tonnes of waste. The Department estimate total disposal costs for these 66 sites is more than £22.3million. 177 people were convicted of waste offences between 2012 and 2015. Nearly £1million was spent clearing more than 2,500 tonnes of waste related to fuel laundering between June 2012 and October 2014. Between August 2009 and March 2016 more than 400,000 tyres burned in fires at recycling facilities. 26 fires were recorded at recycling facilities between August 2009 and March 2016. The Northern Ireland Fire and Rescue Service said that tackling the blazes cost £365,000. ​Each year councils spend more than £165million of public money collecting and disposing of nearly one million tonnes of (legally disposed of) rubbish, including £40million on litter alone. “To clean up these (illegal) sites could potentially bankrupt Northern Ireland, but not cleaning up these sites leaves a toxic legacy and we cannot pass on this toxic legacy to future generations." 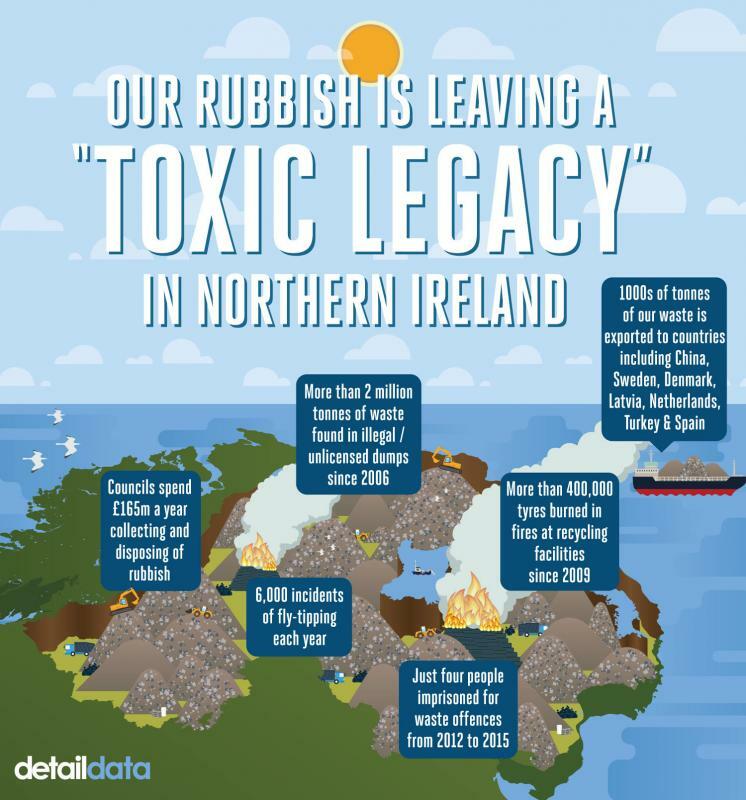 Perhaps the first visible indication of this is litter, which according to Ian Humphreys of Keep Northern Ireland Beautiful costs £80million a year. “We have a £40million street cleansing bill, which as ratepayers we are covering each year,” said. To read the full article by Detail Data's Cormac Campbell, click here.